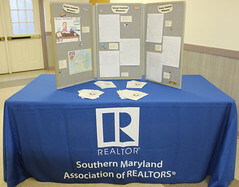 On May 1st, SMAR's Community Relations Committee hosted its annual Essay and Poster Contest Reception. The reception recognizes the winners of the annual Essay and Poster Contests. There was around 40 present including the winners, parents, siblings, grandparents, teachers and even a principal. Essay winners were invited to come up and read their essay’s aloud. Each of the winners received a certificate and cash prize handed out by SMAR President, Lisa Van Tassel. Fair Housing Poster Contest – Students in Kindergarten through eighth grade are invited to create a poster based on a pre-determined Fair Housing theme determined by the Maryland Association of REALTORS® (MAR). This year’s theme was “I ♥ Fair Housing.” Posters are judged locally, and a maximum of three local winners are submitted to the MAR state competition. During the state judging, twelve winners will be chosen to be featured in the following year’s Fair Housing Calendar published by MAR. The twelve winners are invited to a reception at the state house in Annapolis to meet the Governor. This year, a poster contest winner was recognized from Charles & St. Mary’s Counties (there were no entries for Calvert). Essay Contest – Third-grade students are invited to write an essay on the theme “What My Home Means to Me.” Essays are judged locally, and six winners are selected - two from each of the Southern Maryland Counties. Visit our Community Involvement page for other initiatives for the community. When I think of my home I think of love, support, safety, blessings, and family. I love my home because of the special bond and love that we share. It’s special to me because it’s special to my family. Nobody else has the special bond and love that my family shares. My home is the place where I can go and know I’m safe. My home is also a place where good ,bad exciting and amazing memories happen to me and my family. My home means to me so much. It’s my shelter and warmth. When I see different people with no home and no money I think about how I can help them. I feel like I can do anything at my peaceful place; home. I go and get warm and I play with my sister. My house means to me shelter, love, and kindness. I pray that people with no home are able to get one like mine. Our house is very clean because we do our chores. My chores are cleaning the car, help vacuum the house, and fix my room. It is very warm because we have a lot of blankets. There’s a lot of laughter because my mom and I make jokes. It is very loud because my parents watch a Pilipino show or there’s a party. Everyone is Pilipino in my family. We work a lot in sports and in school. We have a safe spot. It is the basement. We pray every day. I mostly pray to myself. My neighbors are inside a lot. It’s always quiet. My family plays sports. My dad and I play basketball. My sister and mom plays volleyball. My favorite meal is Asian foods. The last thing is I love my family. My home is a very unique place to be. I am blessed to even have a home. My home is a safe, warm, comfortable place to be. At my home we have a lot of laughter. My home is a very happy place everyone is always in a good mood. In my house we are very messy. Sometimes we have sorrows in our house but we always make out ok. We praise God every day we say prayers. I love my home that is what my home means to me. My home means a lot to me because not all people in the world have a house. In my home we have five people living in my house. Monroe and Stella are my little sisters. Monroe is two and Stella is five. Now let’s get to the point, I have many memories to share with you but I’m only going to share a very special and crazy memory. Every morning for eight years now I have had to share a shower with five people. In my home we have only two showers. So it is very hard and crazy to get ready in the morning because I have to go to school every day. My sister Stella has to go to school too. And my dad has to go to work and my sister Monroe and my mom have to get ready for a new day. But we stop and think about all the people in the world who don’t even have a house. Even though my is crazy, sometimes I will never give it up. My home is really special to me because I live on a farm. When you live on a farm you have to help out your mom and dad. I also live next to my grandparents, My uncle, aunt and cousin, and nana. On my farm I help my grandparents with the goats, chickens, roosters, and baby turkey’s. In the summer I am going to Hawaii with my whole family. I am going to have a luau for my birthday in Hawaii. After we get back I like to play with my family. My sister and I like to roller skate and ride our electric scooters. Sometimes me and my little brother Lucas like to play hid and seek. I like my home a lot because it is very comfortable. I also have lots of memories in my home. Sometimes my siblings and I like to play tag. Those are all the reason why I love my home so much.